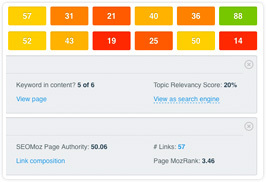 CanIRank is the industry's first SEO Intelligence tool. We collect data and metrics from other SEO services you know and love, then add a layer of machine learning intelligence on top to deliver actionable insights, opportunities, and personalized recommendations. Our goal is to help you spend less time collecting and analyzing data, and more time making improvements that will grow your traffic. When you analyze a keyword, CanIRank collects much of the same data smart SEOs do: link metrics like anchor text, MozRank, Page Authority, and Domain Authority; on-page factors like keyword usage, page quality, and topic relevancy; social metrics like tweets, +1s, and shares; and of course keyword metrics like search volume, CPC, and existing rankings — in all over 200 factors for each URL (that's 2,000+ data points per keyword!). Then, CanIRank goes one step beyond the other tools: we use our industry-leading ranking models to analyze all of that data to provide you with immediately actionable information. Would a page on my site be competitive for this keyword? What are the top rankers doing that my site is not? What's the one thing I could improve to make the biggest impact on my rankings? What are some easier keywords to consider if this one is too difficult? What are some things I can do to improve my Website Strength? Which words should I include to make my page more relevant? CanIRank's recommendations are based upon analysis of over 200,000 websites to determine what's really most important to high rankings — not "expert" opinions. One-size fits all checklists are not enough for competitive SEO. All of CanIRank's recommendations — from keyword suggestions to on-page guidelines to link building ideas — are based upon a thorough analysis of the unique needs, opportunities, and competitive landscape of your particular website. Yesterday's best practices are today's penalty triggers. We regularly update our data models to stay on top of search engine algorithm changes like Google's Panda and Penguin updates. What's the one thing I can do right now to make the greatest impact on my ranking? To answer that question, CanIRank calculates how your website compares to existing rankers in every major ranking factor, as well as the influence of each of those ranking factors for that particular result page, and gives you the answer in under a minute. Thorough competitive research enables accurate diagnosis of your website's needs, so you can fix what's broken and avoid the risk of overly aggressive SEO. "The nail that sticks out gets hammered down." Avoid attracting penalties by making sure your keyword usage (both on-page and anchor text) is consistent with other high ranking sites. Some SEO practitioners always sell the same solution: more links! Would you trust your doctor if he always prescribed the same treatment? 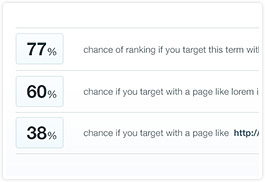 Using a variety of targeted SEO techniques protects you from algorithm changes and creates a more natural profile. Sites often get into trouble when they try to bite off more than they can chew, using aggressive (spammy) SEO tactics to go after keywords that are simply too difficult. Smart SEOs use CanIRank to find low-hanging fruit, building on each success to steadily work their way up the keyword value pyramid. No tool can do everything, so CanIRank connects you to data and features from other SEO tools when they would be helpful for your situation. No one tool can do everything, so CanIRank recommends other tools and resources on an as-needed basis whenever one would be helpful for your particular situation. 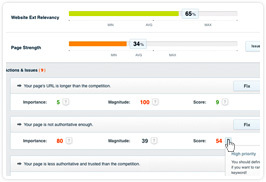 Need to better understand why your keyword relevancy is lower than a competitors? We'll connect you to the "view as search engine" feature of SEO-Browser. Have an issue with link distribution? We'll link to Ahrefs' great (free) overview. Our goal is to make you more productive, not lock you in to our toolset by duplicating what others already do well. Sometimes the help you need isn't a tool at all. We don't succeed unless you do, so we make sure a real person is available to chat whenever you need a hand. All plans come with free expert consulting to help with tricky issues and make sure you get the most out of your membership. DIY, Full Service, or Hybrid? If you’re on a tight budget, CanIRank gives you everything you need to learn and succeed. But sometimes it can be nice to consult an expert — our pay-as-you-go Service plans let you get help when you need it with no contract or commitment. And if you like the idea of a team working on your behalf but want to maintain control over big picture strategy and complete transparency into what work is being done, then our hybrid software+services options are for you. Ready to Crush the Competition?